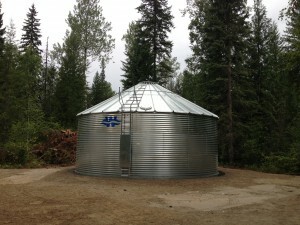 Western Tank & Lining Ltd. supplies and installs heavy duty corrugated galvanized steel storage tanks. These tanks are very well suited for agricultural, industrial, water, and wastewater storage applications where open top tanks are specified (steel roofs, floating and sealed covers are available). Steel tanks are less costly to maintain, and much more durable than concrete or earthen containment systems. Our fabrication plant is ISO-9001 certified (QCB#94-60). Professionally engineered to exceed today's strict environmental guidelines and regulations these Canadian made tanks range in volume from 7m3 to 3600m3. 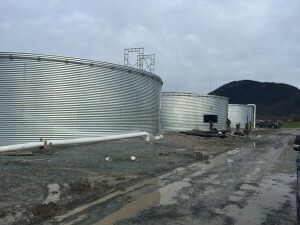 Heavy Duty G-115 galvanized steel construction and superior quality components allow these tanks to withstand harsh environmental conditions and provide excellent corrosion resistance. The top and bottom of each tank is reinforced with a 50mm x 50mm 90° rolled angle, which can also be used to anchor the tank to a concrete floor, ring beam, or compacted sub grade. The choices for a lining system include 60mil (1.5mm), or 80mil (2.0mm) thick High Density Polyethylene (HDPE), 36mil (0.91mm) or 45mil (1.13mm) reinforced Polypropylene drop-in liners (ideal for remote locations). Superior puncture and tear strength are key properties for these materials. Both these lining materials offer long life spans (20 years plus), are water potable, and have excellent chemical and U.V resistance. A cushion of 8oz non-woven geotextile between the sub-grade, tank, and liner provides an extra layer of protection. These heavy-duty tanks and lining systems offer safety and durability. Each component is chosen for it's superior quality. Current Westeel water tanks are designed using an importance factor of 1.0, a live load factor of 2.5, and a resistance factor on the sheets of 0.9. Using the limit states design method, this works out to a safety factor of 2.77 or higher on all of our sheets. We use the higher load factor of 2.5 rather than the usual 1.5 for a number of reasons. They are: wind loading when the tank is empty, potential wave action of the water on the sheets, and potential uneven pulling on the sheets by the liners. Because the lightest sheet we use is 15 gauge, the safety factor on the top ring or two is often much higher than 2.77, which gives added resistance against wind failure, which commonly occurs in the top rings of an empty tank.